Brilliant Solar Panelings knowledge and experience is critical to integrating solar energy systems into a building structure. When properly designed, a solar array is attractive or unobtrusive, and functions as a component of the building’s architecture. Solar arrays are appropriately regarded as a design element like windows and rooflines – not a disruption of the designer’s vision. A team of engineers to assess a facility’s energy usage and provide a profile for future electricity needs. Assistance with the engineering, technology and design of solar photovoltaic arrays. Expert understanding of local codes and regulations that assist developers in speeding up the permit process. A referral network of professionals who can add their expertise to the success of a solar installation. Brilliant Solar Paneling is on call to advise architects and offer options that take advantage of the ease by which solar panels can be integrated into a building’s constructions. Brilliant assesses a facility’s annual energy needs in order to specify the optimal size of a solar array to meet total energy demand. Working with Brilliant Solar Paneling’s knowledge and experience, architects can configure solar panels to fit within a buildings design. Solar photovoltaic (PV) panels are modular and available in a range of sizes, proportions, colors and shapes. Brilliant Solar Paneling helps developers move through the permitting process and guides builder through local codes, regulations and renewable energy requirements. Brilliant Solar Paneling’s financial experts assist with the rebate and paydown cycle, so the solar power system is built to code with the maximum community support available. A solar energy array that is designed in to the structure and appearance of a building is called building-integrated photovoltaics (BIPV). BIPV refers to solar installations that are woven into a building’s design, and not simply bolted on. With planning assistance from Brilliant, a BIPV array can provide for all of the electric demands of a facility, and harmonized with its overall design. It can be an attractive part of the structure or a feature that complements the design. BIPV design considerations include electrical codes & standards and safety issues. As a licensed electrical contractor with decades of experience installing high voltage electrical systems for buildings, Brilliant Solar Paneling advises architects on how to build the safest and most productive solar system for their projects and meet electrical codes. Solar power is best integrated with a building in the preliminary design state. The solar panels and the building proportions and details can be harmonized by the architect in conjunction with Brilliant Solar Paneling experts. Brilliant Solar Paneling provides information about PV panels and their electrical and support infrastructure so the designer can determine how the panels will be implemented. PV solar panels, which are flat, square, rectangular and now triangular in shape, lend themselves to every kind of design for homes and buildings. Modern design takes on a new dimension when horizontal or angled surfaces of a structure also generate clean, reliable electricity from the sun. Awnings that shade south and west windows cut heat gain while generating electricity. Shade structures for cars or outdoor walkways and gathering places. Atrium coverings that admit daylight but protect the inner core of a building. Freestanding pole-mounted arrays that add a design element to the landscape. Typical solar installations are mounted on flat rooftops on angled supports facing south to maximize collection of sunlight year-round. Angled solar arrays can be integrated in the roof design, or hidden behind a parapet like HVAC equipment. 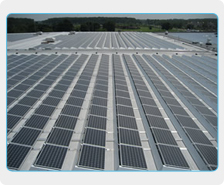 A solar power installation for a commercial building or residential development adds high value to the property. An office space or a house is highly desirable if it can generate its own power, is independent of energy price spikes or rolling blackouts, and doesn’t harm the environment. Designing BIPV from the start should not be an esthetic or technical ordeal. Brilliant Solar Paneling assists architects in sizing the optimal amount of photovoltaic panels for a building’s energy requirements. An architect may decide to make the solar array a key design element of a structure. Brilliant Solar Paneling will offer advice on available technology, product choices and installation to meet the architect’s vision. Brilliant Solar Paneling provides a range of custom mounting designs, generated by its in-house engineers and CADD operators, so that the solar panels integrate with the overall building design. Brilliant Solar Paneling consultants work with the building owner, architect, or developer to assess total energy usage of a facility. The identify areas where energy can be conserved before the PV system is introduced, then design the appropriately sized solar system to cover the actual energy demand. All heating and cooling usage. Updated fluorescent lighting, and lighting controls that respond to occupancy. Computerized motor controls and soft starts for electrical devices. Insulation qualities, including insulated glass, double paned windows and coated windows for low UV and heat gain. Painting a flat roof white. White-painted roofs reflect sunlight and heat, and reduce the energy load. A white roof keeps the building cooler, saving energy needed for air conditioning.